The outer perimeter is framed in Victorian red glow glass. 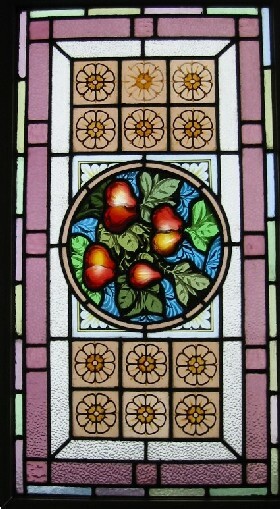 This glass seems to glow with a light of its own in the half light at dawn or dusk or sometimes on a cloudy day. 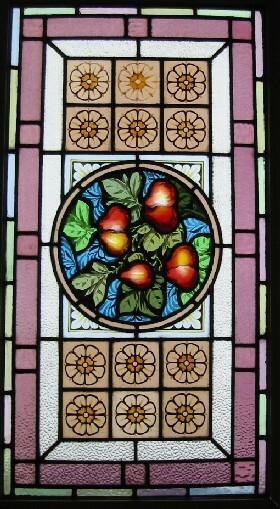 It is an attribute of this heavy old glass to collect and softly diffuse the colours of the light falling upon it. . The frames each measure 24"W x 41"H . The glass measures 22 " x 39"
This Antique Window Shipped and packed to USA would be $199 Including full insurance for loss and damage. You can buy this now by clicking on the credit card icons (Paypal if you prefer) below the photograph or e-mail sales click here to arrange payment by personal check ,money order or bank transfer.